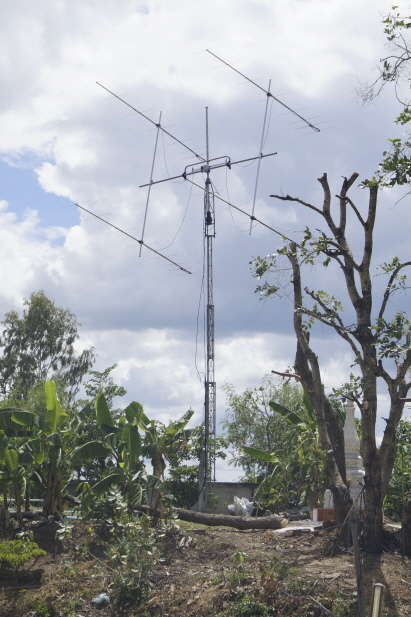 Since March 2008 QRV via the moon from Thailand. I am receiving many QSL Cards! If you want to have confirm HS on the direct way, please add 2$ in the envelope or send via Paypal to: tuxi2000@gmail.com! SASE are not requested! Please no IRC because they are not accepted in my Post-Office!!! All other QSL will be confirmed via buro!! News March 2018: Because of many requests i am now also on Logbook of the world! If you don`t want or need a paper QSL you will have confirmed your QSO via LoTW! Logs will be uploaded in time! News May 2018: Due to a horrible accident i will be QRT for a while. Hope to be back on the moon end of year if the healing process will be good! See you, 73!! News August 2018: Back on the air on HF in FT8-Mode and also listening on 144MHz EME and spotting on LiveCQ if QRV and my Funcube Dongle Pro+ can detect signals. Not already sure when back on TX on 144MHz EME!! News October 2018: My Online-Logbook is online!!! Due to unforseen circumstances i won`t be TX`ing on 144MHz via the moon but i am RX`ing and posting to LiveCQ with MAP65 whenthe moon is up and i`ll be in the shack! News February2019: After some month of recreation i was undergoing another planned surgery on my left foot. Everything went well and i am already back home and preparing my Rehabilitation and hopefully last surgery in Germany where i will go end of May. Therefore i won`t be QRV via the moon until i`ll be back in HS in October this year because of failure of QRO Amplifier. Perhaps i will have a look to the EF9LZ and TO2MB DX-peditions. Found my old RFConcept Amp which was my 1st Amp with QRP in Thailand back in 2008. QRO perhaps when back to Thailand and got repaired my Controler-PCB with EProm on! Thumbs up! Until then only FT8-Operation on HF (mainly 40 and 30m) and RX-ing via the moon with MAP65 and posting on LiveCQ and DXMaps.